When the Beringian east gales, which had driven the horizontal sleet/snow for eight continuous hours, blew Pete Isleib through the door into the common room, the clock on the wall said 5:45. The first dinner shift was 15 minutes away, but no one had moved. Louie Banker was slouched in his customary position beside the radio, but nothing had come in all day because no one was out there. Louie’s sonorous snoring droned over the desultory banter of the card players. A few dogged scribes were scribbling in their journals held inches from their faced in the dim, murky light. The rest were either dozing or trying to read. Pete Isleib is the embodiment of the term “indefatigable.” His unexpected entrance from the jowls of the howling storm turned forty heads and his condition brought hope to forty faces. His full beard and mustache, like his heavy down parka, were totally encrusted with ice, his face the color of the coils on the space heater next to Louie’s chair, which had long since lost the daily battle against the cold and damp. Pete’s physical endurance and intense enthusiasm were legendary throughout the birder’s world. Those who knew him found it easier to picture him making the 12-mile trek to Alexai and back along the muddy traces euphemistically called roads than to imagine weather bad enough to confine the hardest core birders in North America to quarters all day. My wife and I had spent the previous day, in the same weather, with Pete and Frank Jestrab, we the only four fools about outside. Frank was 73, and, though interested in birds, had come to Attu to remember—he had fought the Japanese here in 1943, the same year my father, Lieutenant Colonel James P. Burns, Seventh Cavalry, was killed on Luzon. We had fought our way through the gales out to Murder Point, then on around to Krasni over rain soaked tundra and moss slicked boulders, scarcely able to see our feet beneath us, knowing at every step Frank was going to slip and break a leg. Pete and Frank, each lost in his own world, were having the time of their lives. And we had found a Mongolian Plover. Today, the bad news was that Pete had turned up no Asian vagrants. That was the good news too. It is the essence of the Attu experience that the crackling of the radio on a bad weather day is accompanied by equal parts anticipation and dread, elation and foreboding. As Pete thawed out and it became known he had seen nothing more noteworthy than a Snowy Owl flying the ridge behind Navy Town, forty privately relieved minds slipped thankfully back from the precipice of a frenetic, bone-chilling forced march into the worst elements on the North American continent. 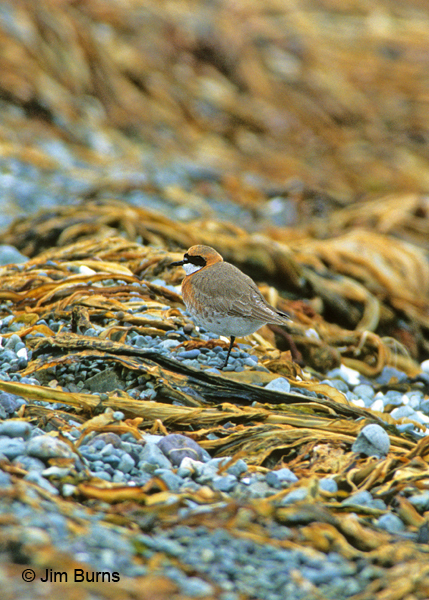 Typically an Attu sunup consists of a bright suffusion through the clouds or fog and the dawn chorus is simply a male Lapland Longspur serenading his lady from the top of a tundra umbel whipping in the gusts. The storm had diminished overnight, but since it had not come from the south and west there seemed little likelihood of Siberian breeders blown off course. The leaders met to discuss the feasibility of a hike into the Temnac Valley for the White-tailed Eagle. The Temnac had long been the home of a nesting pair of these magnificent birds; rare, declining, and little known breeders of Greenland and far northern Eurasia. Most years the pilgrims on Attu would observe one flying over base camp on its way to the coast. If the days waned without an observation, a couple of leaders would attempt the arduous five-mile hike over the snowfields of South Pass into the eagles’ valley home. One of the pair had not been seen for several years now and was presumed dead. Eagle anxiety in this year’s group was running high. There had been no flyovers. The Temnac hike was never a given and it had been a winter of heavy snows. Canvassing the faithful for the most hardy, with dire warnings to the less hardy not to be foolhardy, Jerry Rosenband and Paul Baicich collected thirteen of us to give it a go immediately after breakfast, to see how far we could negotiate the snowfields. In the best of times hiking over tundra is far from the trivial matter it might seem, a constant, thigh-burning maze of hummock and hole, which exhausts the unfit. Slick with rain and runoff, it becomes a serious aerobic exercise that exhausts even the fit. Covered with a thick snow crust that hides the holes, the terrain becomes a nightmare. Unless you are an eagle, there is only one passable route into the Temnac, even in high summer after the snow is gone: follow the Peaceful River valley up over South Pass, slipslide 300 feet into the ravine of George’s Creek on ropes secured by metal stakes driven by previous pilgrims, ford the icy creek, then negotiate one last rocky incline before slopping through the quagmire of the Temnac meadows. Jerry and Paul knew the worst part of the hike would be the first miles, where the heaviest snowfall lingered. Once on the highlands toward the pass much of the snow would be scoured away by the winter winds. Half a mile out I took the group’s first misstep, plunging to my armpits as a rotten snowbridge gave way over a river channel. Hurriedly I was extricated before Jerry and Paul noticed, for they might have turned us all around. The bonding of total strangers, totally out of their element but isolated together and for a shared avocation, is one of the primary truths of Attu. By the time fourteen gentlemen waxing chivalrous had coaxed and half carried my lovely wife, elevationally terrified and the only woman on the Temnac tour, down the rope to the creek, we were unfazed to find it running knee deep. Some took the icy plunge across the slippery cobbles in bare feet, saving dry boots and socks for lunch and eagle. Some had fashioned gaiters from plastic garbage bags. Some waded through oblivious to the soaking, knowing/hoping body heat from the strenuous hike ahead would dry them inside out and preclude hypothermia. As we sprawled across the damp grass for lunch in the lee of a tundra heave, speculation ranged from when the eagle would come to why no one had ever died on an Attu tour to just what we all were doing here. And then the eagle came. Some had it in their binocular field simultaneously with the Peregrine flying beneath it—and below that the flock of Aleutian Rosy-finches. Two of our three speculations having been answered, Gil Ewing produced from his pack a bottle of wine. The grueling hike back out of the Temnac had been trivialized. As we crested South Pass and stopped for snacks and water, Louie’s voice crackled over the radio telling us the eagle had flown over base camp this morning. Groans met this first announcement, replaced almost instantly with smirks and smiles of satisfaction. Their eagle had been just a passive fortuity on just another layabout camp day. Our eagle, actively sought, had been a lifetime-once experience replete with memories of camaraderie in shared hardships and solved problems. Louie’s second announcement was that Terry Savaloja had refound Pete’s Snowy Owl and was sitting on it in case anyone wanted to see it. I was the only taker on the owl. No one comes to Attu for Snowy Owl. Though certainly an arctic specialty, it is not an Asian vagrant nor is it all that uncommon in the Lower 48 due to its periodic winter irruptions. Such was the experience of this year’s Attu sojourners that it was not a lifer any, and so jaded were they by thoughts of storm-tossed exotics from another continent, that none but I cared to detour the 2 miles or so to where Terry waited above Navy Town, for another glimpse at one of the most magnificent of raptors. Snowies are the size of Great Horneds, smaller than Great Grays, but heavier of body. Powerful enough to take ptarmigan and geese, they prefer, on arctic breeding grounds, to prey on a rodent, the lemming. Older males are truly snow white, but females and younger birds, particularly those displaced to the States in winter, will have much dark spotting and barring. I had seen two Snowies prior to this, both winter birds in Washington state. For birders with limited arctic experience but an appreciation for the mysteries of the more southerly and typical owls and how they live, the sight of a bird this size and color hunting by day and so obviously a raptor, is fascination bordering on astonishment. When I found Terry he was hunkered down just below ridgeline, scope set up on the owl farther down the ridge. It was teed up on a tundra heave just like the pingaluks of the true arctic. The bird was 100 yards away, what light left of this gray and misty day reflecting from the lemon yellow eyes, the heavily feathered lores giving every appearance of a neatly clipped mustache. For over an hour we watch as the bird, presumably a male with little barring, hunted the stark landscape. Though he made occasional graceful and deliberate forays (reminiscent of a Short-eared Owl) out over the grasses, he mostly sat waiting, seemingly indifferent. Apparently there were mice about. From time to time his head would snap alert or swivel completely to echolocate some rustling beneath his perch. What followed then was a downward jump on half-raised wings askew for balance. Awkward but efficient on the ground, the owl would flop around for several seconds, splaying a taloned foot here and there amongst the hummocks, then return to his post with mouse in beak. Terry had seen a pair of Snowies in the area and presumed they would breed though no nest had been discovered. The chance to spend quality time alone with another of our leaders had made small price of the additional time and miles after our Temnac tryst. Though he had seen hundreds of Snowy Owls in a still short lifetime begun as a birding prodigy in the wilds of Northern Minnesota, Terry was as delighted with our extended observation as I and just as dismayed that no one else was there to enjoy this intimate visit with one of the most sought after of North America’s nineteen owl species. Quiet and reflective, Terry revealed his joy in birding all corners of the continent as he spoke of his travels and observations. Although Terry ranked among the top five listers in the country, his fellow travelers would never have known it from his helpful and unassuming personality. As we left the owl, sloshed down through Navy Town, and pedaled back along the darkening miles to base, Terry spoke of the ironies of Attu and his love of this wild and desolate place. Navy Town itself is a moldering tract of flattened barracks and offices abandoned after the war with Japan and now being inexorably reclaimed by frost, wind, and willow bog. Somehow the rotting vestiges of civilization do not seem out of place against the vast treeless backdrop of tundra and mountain, weather and sky, the four verities of the far Aleutians. The island seems a symbol of wilderness prevailing. And for Terry, the Snowy Owl is the signature bird of this far northern wilderness. The Rubythroats, the Bluethroats, even the eagle, are indeed spectacular additions to any life list, but they and all the other Eurasian birds are flukes of geography brought by the vagaries of weather. Snowy Owl belongs here. Snowy Owl is native, a resident since before the Beringian land bridge, a survivor. 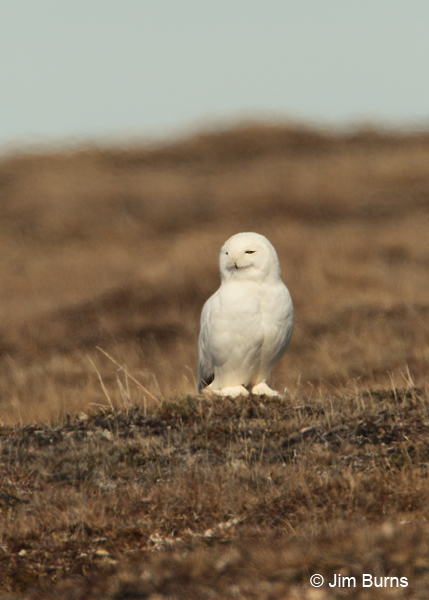 Snowy Owls will roam the bogs and highlands long after the scars of Navy Town disappear into the tundra. Terry and I were late for the dinner serving, and Pete was later still. While we ate I thanked Terry for waiting on the bird for me and I thanked them both for their insights and their passion, for guiding us pilgrims from the Lower 48 across the immense solitude of this breathtaking outpost, compressing the typical joys and frustrations of a birding lifetime into a three-week marathon of exhilaration and fatigue. Over a last cup of hot tea, I offered my allegiance to the gods of wilderness. I told Terry and Pete this day’s highlight for me, the eagle encounter in the Temnac notwithstanding, had been the hunting Snowy. We were the only three on the island to have seen it. This we lamented. I told them we would be back, though I knew not when. We shook hands and embraced.